Landshark Locates is proud to serve all of Ontario and is more than happy to answer any questions or concerns you have. We are committed to safety and use the ORCGA best practice techniques for locating, and as a member of the ORCGA we promote all excavation projects under the banner of “Dig Safe”. Call today to request a locate, or ask to combine our locate service with our drilling personnel on your next quote. Simple. Convenient. Safe. What is the difference between a private and public utility locate? Keeping Employees safe is very important when it comes to the working in the unknown. Its often very hard to understand the dangers of excavating and drilling when the hazards are buried beneath your feet. Imagine if you could easily see Ontario’s underground world, to expose how thousands of kilometers of unseen water, oil, electric, sewage and telecommunication infrastructure was keeping businesses and homes connected with data, power, heat, water, sanitation and communications. Ontario One Call can help to identify registered underground services in the area, except they do not identify and mark privately owned services. Landshark Locates will identify and mark the existence of private utilities such as water, gas, electrical, and communications on your work site to prevent injury to workers and damages caused by a utility hit. Ontario One Call can identify many utilities that are owned by utility companies and municipalities. Landshark Locates can mark and identify utility services that are not covered by Ontario One Call. Utilities such as water, gas, electric, and communication lines may be run out to other buildings on site that are owned by the property owner. These are considered private and will not be marked by an Ontario One Call Request. 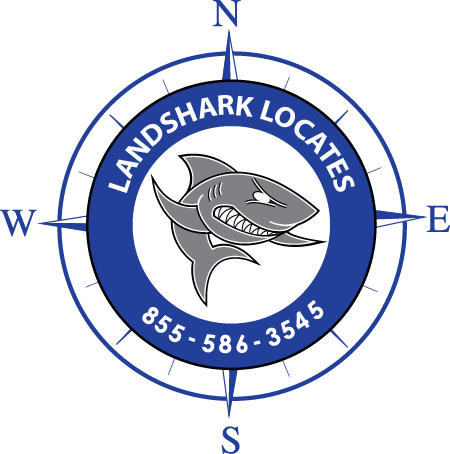 What does using Landshark Locates do for you? No more cancellations due to lack of private locates! Using a Locate service that the drillers already Trust! Reschedule with ease by reducing the number of parties and phone calls involved in your project! The Ontario Regional Common Ground Alliance (ORCGA) is an organization promoting efficient and effective damage prevention for Ontario’s vital underground infrastructure. It has put togeather publicizations for the best practices to follow and some of the laws that mandate private and public locates to be completed prior to excavation. Information on the following regulatory acts listed below is for information purpose only, and are not to be used as legal advice. This comes right from the ORCGA best practices publication for damage prevention. – Prior to excavating, the excavator must be aware that privately owned buried facilities may exist within the work area and should request the private facility owner (e.g. landowner) to locate his/her underground facilities. Practice Description – Privately owned underground facilities may not be marked by representatives of the public facility owners beyond the demarcation point of each facility (e.g. Private Property). The private facility owner is responsible for identifying the location of these buried facilities. Identification activities may include, but are not limited to: provision of maps, provision of engineering drawings from previous workings and/or retaining or authorizing the deployment of a private locator. 9. (1) No person shall dig, bore, trench, grade, excavate or break ground with mechanical equipment or explosives without first ascertaining from the licence holder the location of any pipeline that may be interfered with. O. Reg. 210/01, s. 9 (1). (2) The licence holder shall provide as accurate information as possible on the location of any pipeline within a reasonable time in all the circumstances. O. Reg. 210/01, s. 9 (2). 10. No person shall interfere with or damage any pipeline without authority to do so. O. Reg. 210/01, s.10. 10. (3) Before digging, boring, trenching, grading, excavating or breaking ground with tools, mechanical equipment or explosives, a contractor, owner or occupant of land, buildings or premises shall, in the interests of safety, ascertain from the distributor responsible for the distribution of electricity to the land, building or premises the location of any underground distribution line that may be interfered with in the course of such activities. O. Reg. 22/04, s. 10 (3). By using Landshark Locates to mark and identify privately owned utilities on site prior to excavation, you are following the outlined ORCGA best practices guidelines and reducing the risk of injury and property damage.